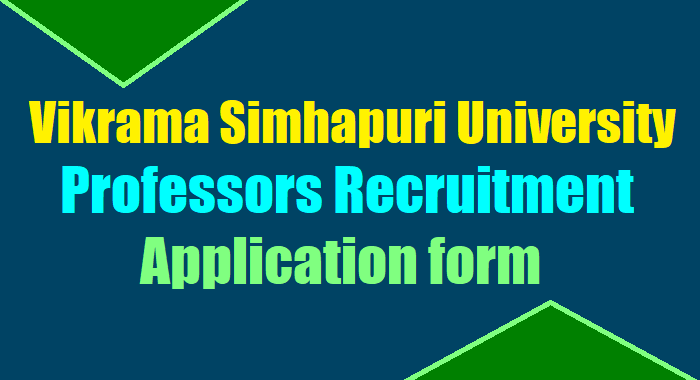 Vikrama Simhapuri University Professors, Backlog Associate/ Assistant Professors, Last date for VSU Professors recruitment, VSU FACULTY POSITIONS Recruitment 2018, VSU Teaching Staff Recruitment 2018, VSU Teaching posts recruitment 2018. Vikrama Simhapuri University, Nellore invites applications for the post of Professor, in the following Departments of the VSU Colleges, Nellore and VSUPG Centre, Kavali. Filled in online application along with acknowledgement of registration fee can be downloaded and the printed copy shall be submitted along with necessary documents to Registrar, Vikrama Simhapuri University, Kakatur, Nellore - 524320, AP on or before 27-01-2018 by 5 PM by speed post/ Courier, Late applications will not be considered after last date 27-01-2018. Online applications are invited from eligible candidates for the Assistant Professor positions in the following Departments of the VSU Colleges, Nellore and VSUPG Centre, Kavali. The candidates can submit online application through the website, http://sche.ap.gov.in/ASSTPROF/Masters/Home.aspx or through the link in http://simhapuriuniv.ac.in website. After submitting the online application, a hard copy of the same should be submitted personally / by post to the Registrar, Vikrama Simhapuri University, Kakutur, Nellore524320, A.P on or before 27-01-2018.